Organomation's MULTIVAPs are ideal for concentrating large batches of samples and are used in numerous sample preparation methodologies. 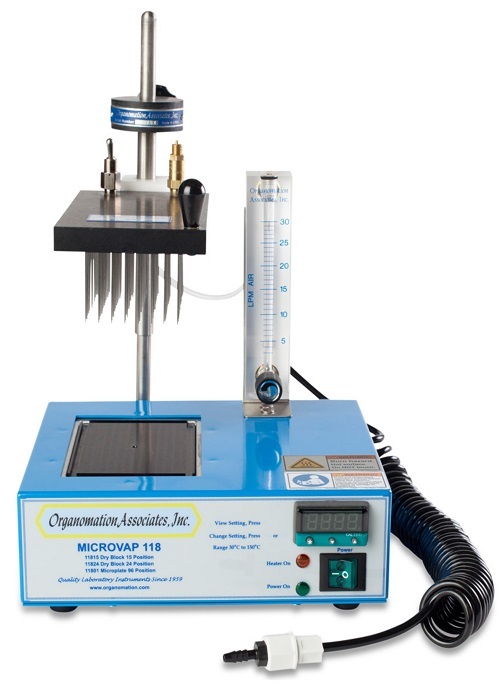 The 9, 30, 48, and 80 position units are available in high-temperature dry block models, while the 64 and 100 position models utilize our classic water bath to maximize sample evaporation. Nitrogen gas is delivered to each sample via individual stainless steel needles connected to the hand-built gas distribution manifold. All of Organomation’s MULTIVAPs include a built-in timer to shut heat and nitrogen gas off for maximum efficiency. Organomation’s nitrogen evaporators utilize adjustable nitrogen blow down technology allowing for full control of nitrogen flow to samples, with no wasted nitrogen gas. They combine this technology with uniform heat applied efficiently through either water or dry baths. This technique saves labs money by simultaneously maximizing solvent evaporation volume and rate.